I have to admit that I had a mini-meltdown during menu planning this week. I was all over the place and couldn’t make a decision. Sometimes menu planning is so simple for me – it all just comes together. Other times – not so much. I was just really over thinking it for some reason. While we were unpacking groceries, I was rambling off the menu selections for the week. Brandon seemed pretty pleased with his options so I guess I pulled it off. We decided to keep it simple tonight with salad and a baked potato. 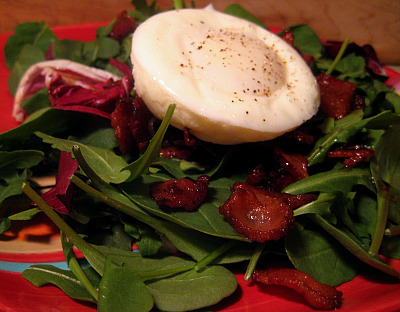 But not just any salad…Frisee Salad with Lardons and Poached Eggs. I flagged this one in The Gourmet Cookbook because a) Brandon loves bacon and b) he thinks pretty much any food is even more delicious topped with an egg. One of his recent favorites has been a fried egg on hamburgers. Extra protein? I actually made several changes to this recipe but it still turned out fabulously. First, we don’t love frisee – we usually pick it out of the salad mix or its left uneaten on the plate. You can’t even buy it on its own at the grocery store where we shop and I was not going to make a special trip for it. I had some baby arugula mix in the fridge so decided to go with that. Second, I realized I was out of red wine vinegar so I used a splash of white wine vinegar and a splash of balsamic instead. And last, I opted to use my egg poacher rather than use the written method for poaching eggs. I will definitely be making this salad again. How can you not love this combination? And the warm bacon dressing is amazing…although I had to put it in the back of my head that it was essentially bacon grease and vinegar. This is a great easy weeknight dinner paired with soup or a baked potato. It would also be an impressive first course for a dinner party. Tear frisee into bite-sized pieces and place in a large bowl. If using slab bacon, cut lengthwise into 1/4 inch thick slices. Then cut bacon slices crosswise into 1/4 inch thick strips (these are your lardons). In a heavy skillet over medium heat, cook bacon, stirring occasionally. Remove skillet from heat when bacon is golden and beginning to crisp. Set skillet aside. In another skillet, place 1 inch of warm water and set aside. Fill up a 4-quart saucepan halfway with water and stir in white vinegar. Bring liquid to a simmer. Break each egg into a teacup one at a time and slide into simmering liquid. Immediately push white around yolk with a slotted spoon, working gently. Egg should be oval in shape and yolk should be completely covered by white. Using the same method, add the remaining 3 eggs. Simmer eggs for about 1 1/2 minutes for runny yolks up to about 3 minutes for firmer yolks. Immediately transfer eggs to skillet of warm water. Reheat bacon in its skillet over medium heat. Add shallot and cook for about 1 minute, stirring often. Add red wine vinegar and boil 5 seconds. Immediately pour hot dressing over frisée and toss with salt and pepper to taste. Divide salad among 4 plates and top with drained poached eggs. Season eggs with salt and pepper and serve immediately. I am with your husband, I love egg on pretty much anything! Everytime we go to Red Robin I get the burger with the fried egg on it! Love it! Your poached eggs are perfect!! I’ve never gotten a poached egg to look so beautiful! I came across your blog recently, and sent it on to my friend who is a fellow foodie. I had told her about this salad, which I had at Five and Ten in Athens for my husband’s birthday in December and kind of forgot about it until she discovered this post and sent it to me. So happy to have the recipe, thanks for sharing! I love your site, it’s a great resource. BTW, my foodie friend used the Egg to smoke chicken wings two weekends ago – fabulous! Katie – it’s so good to hear from you! Thank you so much for checking out my blog and the kind words about it. That’s funny that your friend found the site and passed it on to you! Your foodie friend will have to check out the blog this summer once we get back to Egging! We’re hoping to be out of our apartment and in a house soon.